Teach you how to trade stocks, ETFs, options, commodity and financial futures, and FOREX in a simple and practical way that achieves consistent winning results. Show you strategies that work across multiple asset classes so that you can always find high probability trading opportunities in all market conditions. Help you develop a trading plan that is suited to your trading personality so that you can stop struggling, and start achieving consistent profits. With us, you won’t get economic theories, complex algorithms, or hindsight interpretations. What you do get are real-time analysis and proven strategies that work. self-taught, professional trader with over 17 years of experience trading the markets. He is a CMT (Chartered Market Technician) who specializes in trading stocks, ETFs, options, commodity and financial futures, and FOREX. An entrepreneur at heart, Matt owned and managed a successful car dealership after obtaining his MBA from McMaster University while he traded the markets on the side. He always knew that his passion lies in the financial markets because the opportunities there are limitless, and it can give him the mobile lifestyle that he wants. So he sold his business to focus full time on his trading. Unlike many professional traders whose experience come from working on the exchange floor or for large hedge funds trading other people’s accounts, Matt’s experience and knowledge was accumulated after years of trading his own money. Having been through the school of hard knocks, Matt knows firsthand all the common mistakes of the typical trader and has developed profitable trading strategies and a winning mindset that beat the markets. He shares the “3 Psychological Mindsets You Must Have To Beat Wall Street” in his Amazon Bestselling book “The Winning Way”, which he co-authored with Brian Tracy and other leading experts around the world. While he enjoyed the freedom that his trading success brought him, he wanted to help other traders achieve the same. So he founded Certus Trading to share his hard-learned knowledge and unique experience with other traders so that they can also enjoy the freedom that trading success could bring. Matt lives in Toronto, Canada with his wife, son, and Wheaton Terrier. In his downtime, you can catch Matt enjoying soccer – but only on TV now, after a knee injury made him hang up his cleats. As an avid foodie, he enjoys traveling the world with his family, savoring gourmet cuisine and local delicacies. Thank you for visiting this site. It’s great to have you here. What I would like to do is to take a few moments to explain what this site is all about, and more importantly how it can be of benefit to you. Now, the reason that you are here is because you want to become a better trader, someone who is confident and can make winning trades day in and day out. And to become a consistent and profitable trader, you need to know what markets to trade, you need to have a sound trading approach, you need to have good analysis techniques, and you need systems and strategies that work. And the reason that I am here is because this is something that I can show you exactly how to achieve. You may be thinking, why you should listen to me? That’s a very fair question. Let me quickly answer that for you. I started trading in 2001, and when I first started I thought I knew everything about trading the markets. I had the desire and passion to make it work, and I suspect like you do right now, wanted to make some money for me and for my family. At that time, the bear market just kicked in and basically anything that I shorted made me money. Easy, right? But the markets started to bottom mid-way through 2002 and basically I got chopped up and gave back all my profits and then some. Quite frankly the first few years of my trading was a disaster. I called myself a day trader for a few months but hated staring at the screens all day. When I tried position trading, I didn’t have the patience to wait months seeing my trades through. I felt anxious and fidgety when the markets stalled or moved against me. I gambled on unpredictable biotech stocks before clinical trial announcements. I traded illiquid exotic futures and option positions that had more than 60 legs. I spent thousands and thousands of dollars programming complex trading systems – I remember one of them having more than 100,000 lines of codes, and the results were not much better than a coin toss. By 2005 I was still spinning my wheels, so I decided to wipe the slate clean and start over again. I threw out everything I thought I knew in my head and looked for help. That was when I met my mentor, the late George Fontanills. George taught me many trading strategies and techniques, but more importantly, he spent time to understand my trader personality. He thought swing trading would be most suitable for me. He also told me to specialize in a few markets rather than being jack-of-all-trades. He taught me risk management techniques to preserve capital during tough times, and how to attack the markets to maximize profits when opportunities present themselves. Most importantly, George helped me set the foundation to acquire what I believe is the most important asset in a trader – a winning mindset. 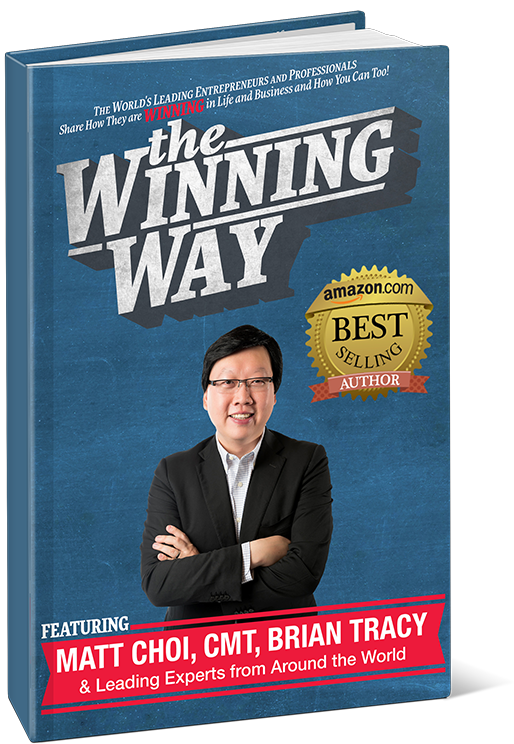 in 2014, I co-authored a book with Brian Tracy called The Winning Way, which is an Amazon Best Selling book. In this book, I talk about The Three Psychological Mindsets You Must Have To Beat Wall Street. And just for visiting my website, I want to give you this amazing book, for free. It’s an actual book, not an e-book, and you can click on the link on this page and get yours before I run out of copies. Long story short, since 2006, after working with George for a couple of years, I have been achieving consistent and profitable results in my trading. Today, I continue to swing trade markets that show highly repetitive technical patterns, and I trade in multiple asset classes, including stocks, ETFs, commodities, currencies, and options in order to stay fully diversified. For example, if stocks are flat I can trade coffee and orange juice. And if commodities are not moving then I can trade the British Pound and the Australian Dollar. And if everything is moving sideways I can trade options and bring in premium. The key is to trade the asset classes with the best opportunities at any given time. then I put my limit orders in along with my targets and stops, and let the markets come to me. My trades typically last anywhere from a couple of days to a few weeks – a time frame long enough that does not require me to stare at the screen all day, and short enough to keep me from being impatient. The bottom line is, my trading approach fits my own personality and goals. It allows me to live a mobile lifestyle, travel the world, spend time with my family, and do what I want to do. The best part is, I get to watch my son grow up so fast that I would never trade this lifestyle for anything else in the world! Having been through the school of hard knocks myself, I understand the frustration that you are going through. If you want to learn exactly how I trade, if my trading success resonates with you, if you seek a flexible lifestyle similar to mine, and if you are serious about taking your trading to an elite level, I encourage you to check out the trading courses that we offer by clicking on the “Training” tab on this page. Certus Trading is the website that I wish existed when I first started trading. I clearly remember years ago when I first started out how much time and money I wasted not really understanding the right way to trade the markets. But the thing is there is really no need for this struggle. When you can focus only on the best markets to trade, when you know the exact time and price to enter a trade, when you know when to take profit or a small loss, and when you can do all that without hesitation, then everything becomes much more clear and simple. If you want to stop wasting time and discover how to become a consistent and profitable trader, then Certus Trading is for you. I want to keep this short – if you are interested in learning how to become consistent and profitable in your own trading I would be thrilled to see you inside one of our courses here at Certus Trading. Oh, don’t forget to claim your free copy of my best-selling book “The Winning Way” by clicking the link on this page. That’s all, thanks for stopping by. My name is Matt Choi, and I look forward to seeing you inside one of our COURSES here at Certus Trading.